I found that one single event can completely change the course of your life. In July 2009, what seemed like a random phone call from a nurse at the imaging center woke me up inside. She said “Your mammogram has some irregular calcifications and we need to re-test” Re-test? What does she mean, re-test? No women ever really wants to have the imaging done in the first place and now she is asking for a do-over? I don’t think so! When the 2nd images were taken, I remember hearing those fateful words biopsy. The last time I heard that I quickly lost my beautiful shephard-mix Mack to cancer. Time moved so slowly as I waited for the results, my emotions were high and I experienced a mixture of frightened tears and simply pretending that it didn’t matter. After what felt like eternity, the results were in… I was told “all is well…nothing to worry about-you can relax now…go and have a nice weekend” As quickly as it came my fear dissipated, it was at that moment that a spark was ignited in my soul. I promised myself I would start living again. I needed to make a difference. My current existence, was just that- an existence, it was no longer acceptable and I knew then something had to change. Change came one month later. I remember clearly, it was a Saturday morning in September. After a short bike ride, I came home and did a Google search. It was then that I found a cause that touched my heart. After a few emails and a visit in person I decided to join Cycle4Strays on the 2010 epic endurance ride. I was so excited! 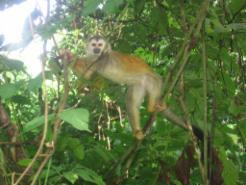 Did someone say Best Friends Sanctuary and Costa Rica? Dear God, I knew I had to be a part of this ride. I didn’t matter that I never really rode more than 10 miles at a clip, let alone never clipped-in in my life …my decision was made and I had 4 months to train. Everything fell into place, there were so many bizarre events that made me know I was meant to ride this ride and raise funds for the McKee Project a group that I quickly became passionate about. Their cause was congruent with everything I believed. I went ahead on faith. With little-to-no money, I secured a personal trainer two days a week to help build my upper body strength (it’s funny how things come easily into your life when they are right). Mike Roshaven from Blast Fitness and Performance Center was invaluable during the months of training. He not only trained me physically, but reminded me everytime I saw him that anything is possible. Belief is key. What you think becomes. I was once told “A belief is a thought you just keep thinking”. I decided then to think only thoughts that would serve me and serve others. My driving force and passion is the Animals. My vehicle is the bicycle. My goal is to be a voice for those who can not speak to us. I want to spread a word of hope and promise. Hope that one day puppy mills will be closed forever. Hope that abuse and neglect will end. Hope that over population will no longer be an issue in the US and around the world. Why do I Ride 4 the Animals? Because my heart won’t rest knowing there is still a difference to be made. I am their voice. I hope you will hear me. 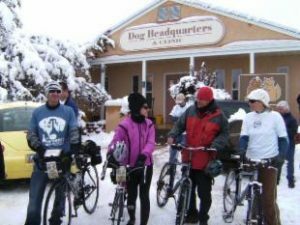 In January 2010, I was given the opportunity to cycle in Utah and Arizona on a journey to raise Spay and Neuter awareness and funds for the McKee Project in Costa Rica. Cycle4Strays is an inspiring organization that is making a difference in Mexico, Costa Rica and other parts of Central America. In April 2010, I went to Costa Rica to celebrate the completion of the Cycle4Strays cycling event and to ride the final leg in Alejuela. 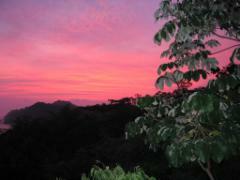 I fell in love with the perfect beaches, incredible wildlife and untouched beauty of Costa Rica. The cycling event was a life changing experience. Update: We dedicated the 2014 ride In loving memory of Sharon Ingle, who ended her battle with cancer on November 6, 2013. Her passion for animals was unmatched and her love for life and cycling was inspiring. She is now pain-free and happy. Sharon, This one is for YOU! You will never be forgotten. We miss you so very much.